This month, I'm participating in WEGO Health's National Health Blog Post Month (#NHBPM). Which means I'm attempting to post every day during the month of November. I'm hoping their prompts will be just what I need to get myself out of a blogging rut. Topic for Day 1: "Why I write about my health." Why do I write about my health? I write about my health for two reasons: to help myself and hopefully help other people. When I first stumbled onto the Diabetes Online Community almost two years ago, I was completely and utterly lost. Burnout had me tight in its grip, and I felt so alone. I wasn't taking care of myself, and didn't know how to turn that around. But then I started reading some blogs. Joined Twitter. And it completely changed my life. That's not an exaggeration. Reading other people's posts made me realize that I wasn't alone. That living with diabetes is difficult for everyone. That we all have our own struggles and triumphs. Through the words and friendships of other people with diabetes, I was able to change. One step at a time. Today, I am in such a better place than I was two years ago. Not only with my diabetes, but with my mental health. Again, my friends online inspired me to seek help for my binge eating. I don't think I would have had the courage to find a psychologist without reading stories from other people. Their stories took the shame and fear away. I started writing this blog to help myself. This is a place where I can vent and share what's going on, and that helps me process things that are going on in my life. But that's not why I keep writing. I keep writing in the hopes that I might be able to help someone else as I have been helped. That's why I share so much. Not only about my diabetes, but also about my binge eating, and feelings of depression and anxiety. Do I overshare? Probably. But I wouldn't be where I am today without the stories of other people. No matter how we feel, we are never alone. Hello, fellow PWD! 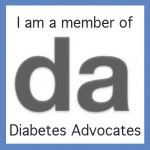 I also started my blog when I got diagnosed with diabetes. I am excited to get to know you through your NHBPM posts this month! And you sharing your stories will help many others take the fear and shame away too. Thank you for being brave and doing what you do. It makes a difference. Nicely stated. I couldn't agree more, and I share some of your experiences in how I discovered the DOC too. Keep up the great writing.